Doan Thi Huong (center) leaves the court in Shah Alam, Malaysia, on Monday. Prosecutors have dropped murder charges against her. 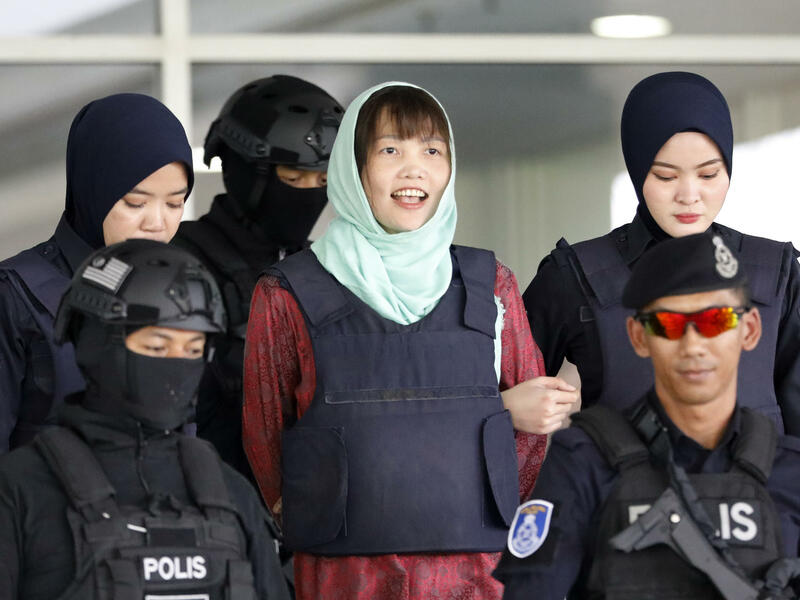 Huong, who is said to be 30, has been in custody in a Malaysian prison for more than two years since the brazen daylight attack against Kim Jong Nam as he walked through an airport terminal in Kuala Lampur in February 2017. Malaysian prosecutors charged Huong and an Indonesian woman with murder. Both women said they thought they were participating in a prank for a Japanese game show. The Indonesian woman, Siti Aisyah, was unexpectedly freed last month after prosecutors dropped all charges against her. After extensive lobbying by the Indonesian government, the Malaysian attorney general had personally approved the decision to release Aisyah. Huong was kept in custody, and the attorney general ordered that her murder trial proceed. But pressed by the Vietnamese government and Huong's lawyers, the attorney general decided to offer a reduced charge, The Associated Press reported. On Monday a judge sentenced Huong to 40 months in prison, and her attorneys say she could walk free as early as May after time served. With Huong's impending release, no one will be left in custody for Kim's murder. Four North Korean suspects, believed to have been responsible for the attack, fled the country within hours. Huong's lawyer told reporters those North Korean suspects were the "real assassins," the AP reported. They "exploited her weakness and manipulated her to carry out their evil designs under the camouflage of funny videos and pranks," he said. The North Korean government is widely believed to have ordered the killing. The U.S. State Department determined last year that North Korea had "used chemical weapons in violation of international law or lethal chemical weapons against its own nationals." By tradition, Kim Jong Nam — the eldest of three children — would have been named leader of North Korea after Kim Jong Il died, former CIA analyst Jung Pak of the Brookings Institution has explained. But he was "tainted by foreign influence" and therefore unfit to lead, Pak said: In 2001 he had been "detained in Japan with a fake passport in a failed attempt to go to Tokyo Disneyland. More seriously, it is said that he had suggested that North Korea undertake policy reform and open up to the West, enraging his father." The director of South Korea's National Intelligence Service reportedly told South Korean lawmakers that ever since Kim Jong Un became supreme leader, "there has been a standing order" to assassinate his half-brother. "This is not a calculated action to remove Kim Jong Nam because he was a challenge to power per se, but rather reflected Kim Jong Un's paranoia," he said.